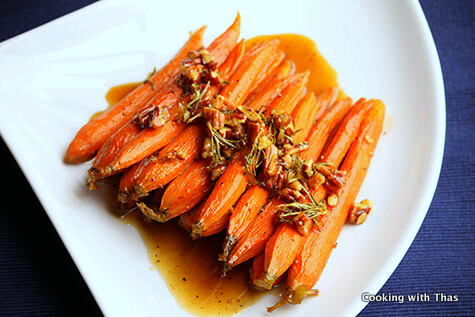 Carrots glazed with brown sugar, butter and honey. Fresh Rosemary leaves impart nice aroma and flavor. 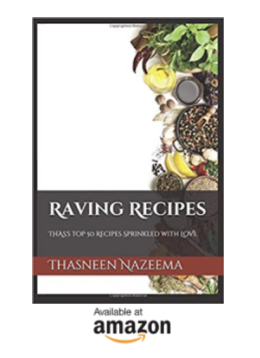 This makes a perfect side dish for Thanksgiving dinner or any kinds of dinner. You could use whole mini carrots like the ones I've used or regular carrots cut into long thick wedges. Firstly, cook the carrots in boiling water seasoned with salt till they have turned slightly tender- do not over cook. Remove the carrots from the boiling water. Place a large non-stick pan over medium heat, melt butter and add honey, brown sugar. Keep stirring till sugar has dissolved. Add rosemary leaves, combine well. Add the lemon juice, combine well. Add the carrots and keep stirring, let the sauce coat the carrots well. Cook stirring frequently till the sauce has thickened and the carrots turn glazed. Add the nuts, combine well and cook for a minute. Sprinkle ground pepper over the carrots, combine well. 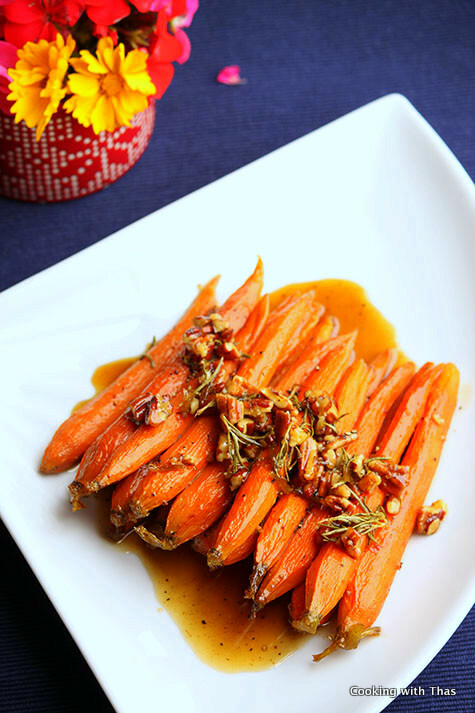 Serve as a side dish, sweet and flavorful carrots.